Home » Dedicated to Advertisers » Attribution vs. Payment Models in Marketing: What can I do to pay less for a sale? Who generated the sale? How has each marketing channel contributed to the conversion? There is a common confusion between attribution models and pricing models in online advertising. This confusion leads to wrong business decisions and ultimately wasted money. The attribution model involves tracking conversions for all traffic sources based on a model in an analytics tool (such as Google Analytics or Omniture). However, there are very few situations in which a transaction is generated by a single promotion channel. In general, 80%–90% of transactions are generated after a user interacts multiple times with a brand, across multiple platforms and multiple promotional channels. The example below shows that transactions involving 12 or more interactions (accounting for 54.82% of the total transactions in this example) have an average sales value almost three times higher than transactions involving only a single interaction. Furthermore, transactions involving only one interaction represent only 16.23% of the total number of transactions and a mere 8.1% of the total value. Therefore, asking “Who generated the sale?” is asking the wrong question. The real objective is to determine how each marketing channel contributes to the conversion so that you can generate more traffic, and thus more sales, at better cost. Google has also developed a data-based model that is specific to each advertiser. An advertising network cannot develop an attribution model for all of your store’s traffic sources simply because it does not have access to all these traffic sources. The tools you use for web analytics have the information you need to be able to do your own cross-channel assignment analysis. You can analyze the attribution for all traffic sources in Google Analytics or Omniture, but not Google, AdWords, Facebook Ads, Price.ro, Mailchimp, RTB or Criteo. Depending on your analysis and the strategy you use, you should explore one model or another. For example, suppose you want to see how blogs contribute to generated conversions. Content sites usually are involved early in their buying cycle. This means that a user who actually purchases will click to a blog post much earlier before deciding to make the purchase. After clicking on the blog, they will most likely follow either a newsletter link, two Google AdWords ads, or an affiliate link (for example). In this case, if you judged the contribution made by the blog according to the last click model, you would be wrong. Moreover, if you only look at the last click, you won’t consider how you interact with that client on all the other channels you are on. If your strategy is to focus on blog campaigns, your analysis model should focus on first interactions. 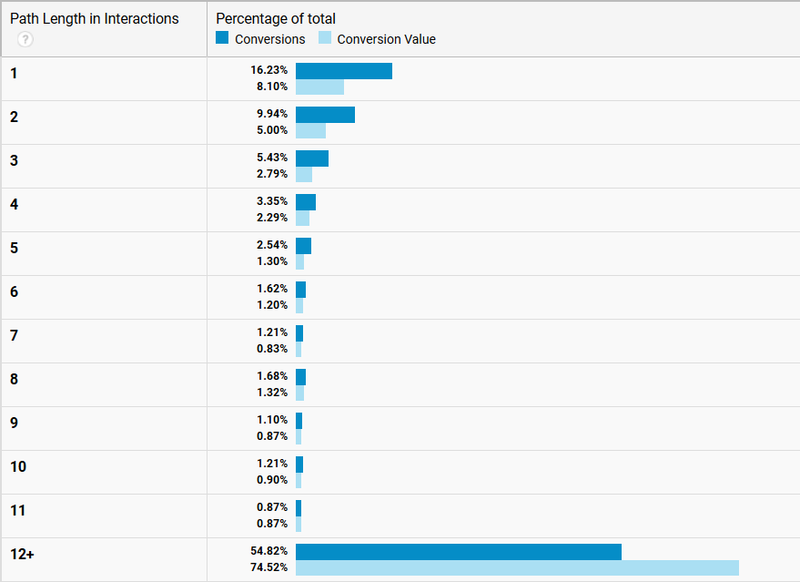 And, very importantly, you’ll look into the Google Analytics report that shows your assisted conversions. In this way, you can see which channels opened the way for the transaction. How do you pay for advertising? The term payment model refers to how you pay for each promotion channel you use: CPM (cost per thousand impressions), CPC (cost per click), CPV (cost per view), CPL (cost per lead), or cost per sale (CPS). In the vast majority of cases, a user has many interactions with your brand, on a variety of channels, in many combinations, before reaching the transaction. This is what’s called the conversion path. And yet, what can you yourself do to pay less for a sale? The role of marketing is not to win beauty pageants. The role of marketing is to generate sales and increase the company’s turnover. Company growth can be achieved through performance marketing channels that directly influence sales or indirectly through channels that can generate awareness and demand for a brand and a company’s products (let’s say this is the role of traditional advertising). Calculate how much you can pay for a sale. Rigorously, this is calculated by customer lifetime value (CLV). What you earn from a customer while they are a customer (CLV) should ideally be significantly more than it costs to bring that client to your site. Calculate the CPC for each channel (how much you paid / how many valid clicks you received) as well as the CPS (how much you paid / how many valid sales it generated). At this point, you only need to look at the channel level (2Performant, Google AdWords, Price Comparator, Facebook Ads, etc.). This will tell you how much of a sale’s cost that channel has contributed irrespective of the position it had (one click, last click, middle click, etc.). Then explore the attribution models according to the strategies you follow. If you want to focus on content sites, then you’ll apply models that give more credit to the marketing channels that appear earlier, near the beginning of the conversion process. If you want to focus on price comparisons, you’ll use models that give more credit to marketing channels near the end of the conversion process. If a channel has good results (low CPC, profitable CPS, traffic volume, sales volume), and / or it makes a good contribution to your sales strategy, then increase the amount you’re willing to pay for that channel: for instance, increase your bid on Google AdWords or Facebook Ads, the percent of the affiliate commission, or the bid to display the ad on Youtube or other publisher. If a channel does not get good results, then you should decrease the amount you’re willing to pay for that channel. Is AdWords a good channel for your strategy? Is it bringing you sales at a good cost? Then increase your bid to get more traffic and keep track of what’s happening with cost-per-sale (CPS) and total budget. Is Facebook Ads bringing you a lot of traffic but only a few conversions, leading to high CPS? Reduce the bid. You will pay less for a click and you will keep track of what happens with the cost per sale (CPS). 2Performant brings you traffic that converts and is aligned with your strategy. Then, you can increase the percentage of sales you offer to affiliates. If you want to encourage a certain kind of affiliate (such as affiliates who send traffic through PPC), then increase the percentage you give to those affiliates so that they can cover their media costs and still earn a profit. If you want to encourage affiliates who are writing content, then increase the cookie life you offer to those affiliates because these affiliates are more likely to intervene at the start of a sales cycle. Is it a channel that overlaps with other channels and would you rather encourage channels that contribute later on in a sale? Then increase the bid for those channels and lower your bid for the rest, keeping track of what’s going on with traffic, CPC, sales, and CPS for each channel and business. 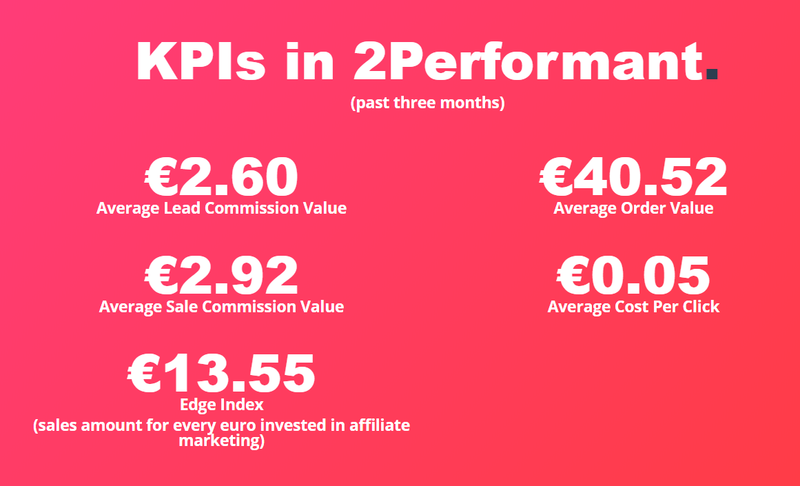 So how much does promotion cost through 2Performant? Short answer: You decide how much. You choose the percentage you pay affiliates for each sale that they generate. To give you an idea, in the past 3 months the average commission per sale was €2.92, meaning 7.2% of the average sale price (€40.52). If you paid for click promotion (CPC), then you would have paid an average of approximately 5 cents per click. You can find more data on the public statistics page.